Exquisite Beauty. 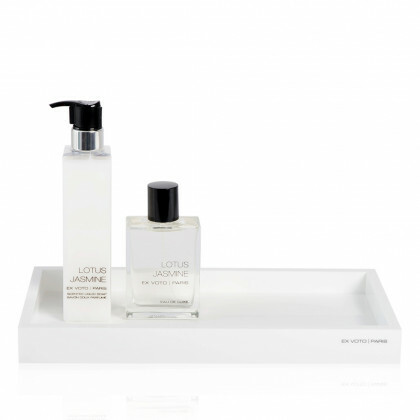 Dedicated to true fragrance connoisseurs, the elegant Black and White Edition of gentle liquid soaps is as appealing as effective. Four exquisite fragrances embody the Ex Voto Paris spirit: Fig Tree Leaves, Lotus Jasmine, Datura Cedar and Leather Vetyver. Formulated with Macadamia Oil and organic plant extracts and a unique soothing texture, these impeccable toiletries presented in crystal-clear bottles convey an extreme sense of purity and softness. Aquatic and Refreshing. 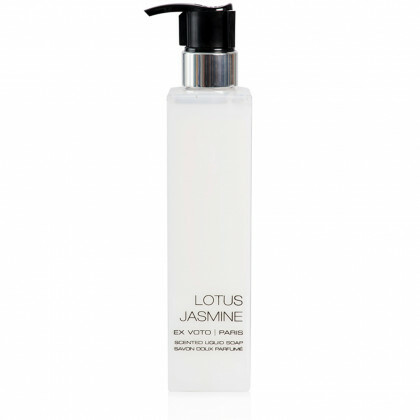 A flawless balance of pure freshnes defines this gentle Lotus Jasmine hand and body wash that provides an intense feeling of purity with its clean fragrance. 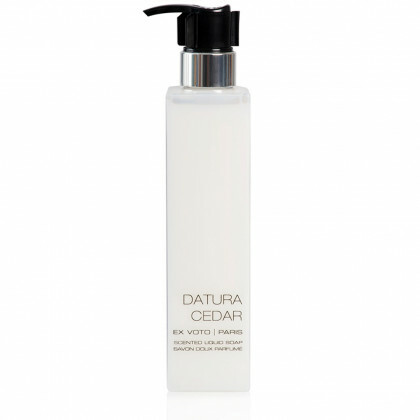 Enriched with organic Macadamia Oil, Calendula, Olive leaf, Lotus and Green Tea, this paraben-free soap softly cleanses the skin, leaving it fresh and delicately perfumed. Striking and Powerful. The Leather Vetyver hand and body wash radiates a complex blend with noble notes of Sicilian Lemon, Vetyver, Incense, Leather, Cypress and Tea Leaves. Enriched with organic Macadamia Oil, Calendula, Olive leaf, Ginseng and Gingko Biloba and paraben-free, this gentle hand and body wash softly cleanses the skin, leaving it fresh and delicately perfumed.